Very good job, P! Like your adaptation very much. And congratz on the new job too...and of course having such sporting ex-colleagues with the farewell party! Awesome!!!! I'm glad you did the challenge, It looks great! Hi Sans, thank you very much. Yes it was nice we had at least a very small party. It was all so sudden! Plushpussycat it's so thoughtfull to offer me this giveaway. Of course I will be a part of it. Mad for Mod, I have to confess that I took this pictures in August 2009 and when I saw your nice pictures I decided to use them once again. Have a great sunday or new week you all! Hey Petra - ist die Küche neue_ so cool! Nein, Neomi, die Küche habe ich schon länger. Nutze sie öfters auch für Wohnzimmereinrichtungen. Das Foto ist schon ziemlich alt, von 2009! thank you Jazzi! Nice you mentioned it!Have a good week. Even if you did this a while ago, it is certainly a job well done. Thanks for sharing this. So creative Oese!! Simply fabulous! Too funny that you did this so long ago. It's just lovely! Dortmunderin, Jahrgang 1957. Anwaltsgehilfin, Mutter, Friseurin, Schreiberin. Selbständig tätig als mobile Friseurin seit 2013. Ich liebe Miniaturen und nutze meine Puppenhäuser und Puppen gerne, um Themen meines Lebens zu Bildern zu machen. 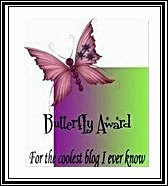 I received some awards from my blogger-friends. 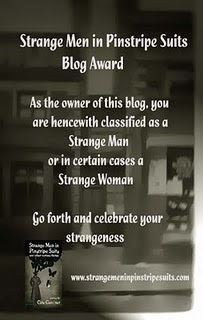 I'm not a friend of the related rules to follow - and I know most of my close blogfriends think the same. So please don't be sad when I dont spread the award I received.